Aloha, and welcome to my 4th Dream Destination – the island (or rather islands) of Hawaii! While Hawaii is a place I really want to visit I have to be honest and say this is more my husband’s dream destination! Ever since he has started watching the new(ish) series of Hawaii Five-O he has this dream of packing up our life and moving there so he can join some sort of task force and drive around wearing cool sunglasses! I don’t think I’m quite ready to make a move to Hawaii, but I would love to visit. Even though Hawaii is part of America it almost seems to me like it’s a whole other country. Set away from mainland America, these beautiful islands are filled with some of the world’s best nature. Idyllic beaches, palm trees and many volcanoes. 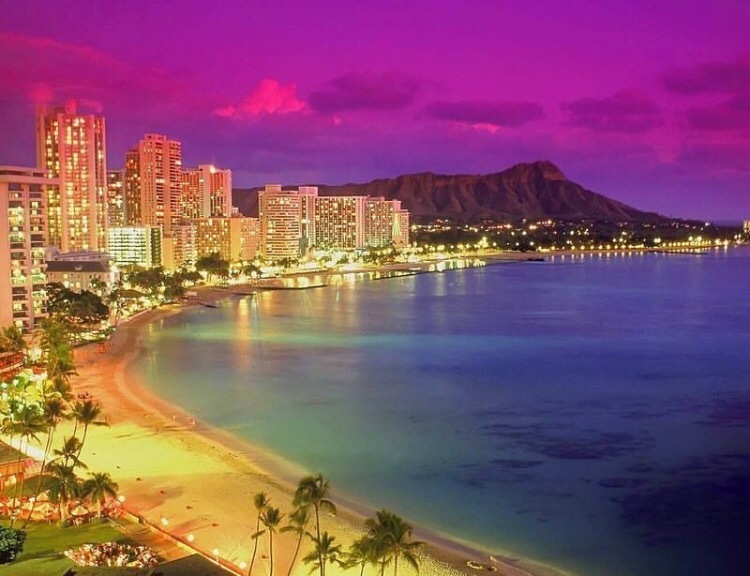 Honolulu, Maui and Waikiki Beach are just a few places I think of when imagining Hawaii. And then there are the people. Perhaps, stereotypically, as I get off the plane there will be ladies in hula skirts handing out leis (and maybe a cocktail?!) as I head into the terminal. From watching Fifty First Dates I imagine the people to be really friendly and for everyone to know each other, and look after each other, at least in the non-touristy areas. In the touristy areas I still imagine the friendliness, but I also imagine a lot of effort being put in to make sure everyone gets the proper ‘Hawaiian’ experience. I also imagine the hotels to be stunning. Lots of outdoor pools where you can chill on a sun lounger (maybe this is where I get my cocktail?! ), read a book and take in the sun. Or for the more adventurous they could join in on one of the hotels daily trips – I’m sure this includes surfing, snorkelling or visiting volcanoes. I imagine the food would be great too, with buffets to eat to your hearts content. At night you would stroll along one of the many beaches, watching the sunset as the water laps calmly beside you. Though not on the cards yet, one of my friends has this dream to get married by Mickey and Minnie Mouse in Hawaii (apparently that’s a thing they do?!) so when that happens I’ll be booking the first flight over there! If we get to Hawaii, we’d be spending time exploring the lava fields and craters – its alive!! If sufficient funds permit, take a helicopter view of the islands! Visit the sites where Jurassic park was filmed and imagine where the Velociraptors will pounce out!